People had to be turned away from the meeting because of the capacity of the room. 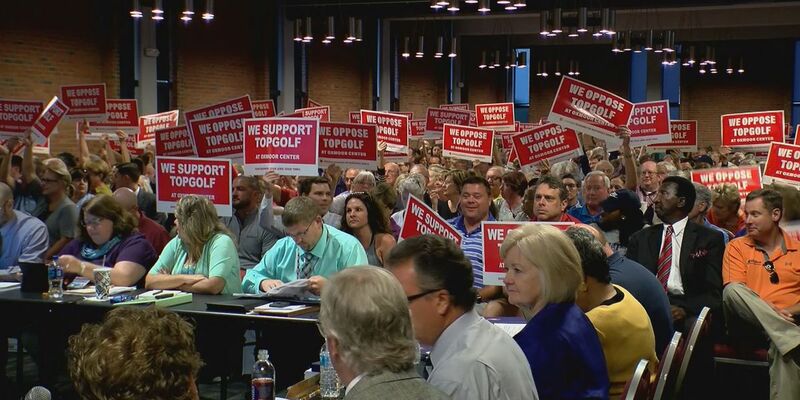 LOUISVILLE, KY (WAVE) - Topgolf needs the Planning Commission to vote “yes” on a Conditional Use Permit to build at Oxmoor Center, then the decision is passed onto Metro Council. That decision could be challenged in an appeal, resulting in lengthy litigation. After two meetings and 11 hours of testimony, a vote will take place at the Planning Commissions meeting on Thursday. The commissioners will also make a rezoning recommendation for Metro Council to discuss and decide on. “This could go very possibly go to court, and I wouldn't doubt that it does, no matter the outcome,” Steven Porter, attorney for the residents in the opposition said. Kentucky is surrounded by states with Topgolf. Some of the closer locations like Fishers, In. and Nashville opened within two years of their announcement. “The neighbors near Oxmoor Center are very serious about opposing this,” Porter said. If either side appeals Metro Council’s decision, that could extend the development process another year or two. Ashburner said Topgolf has invested a lot of time making modifications for the development. Light fixtures that measure a lower light intensity than the current light poles were presented during Monday’s meeting. Not everyone believes that claim. “That’s the beautiful thing about math, you don’t have to believe in it for it to work,” Ashburner said. Ashburner aims to have all the necessary entitlements approved before the end of the year. About a month after the Planning Commission votes, the item will make its way on to Metro Council’s Agenda. Until then, the opposition continues to make their point. “This is not compatible with the neighborhood and you can tell because Oxmoor Center itself closes at 9:00 p.m.,” Porter said. Mayor Greg Fischer and Metro Councilwoman Angela Leet, who is running against Fischer, commented on the development. Leet said she will not vote as a council member. Topgolf is a client of the company she owns. Mayor Fischer’s Communication Director Jean Porter said he supports Topgolf, but won’t comment on the location.